Landfiles allows you to collect data very simply to create illustrations and maps. Let’s see how to proceed. Landfiles is a networking tool that allows you to share the group’s observations and capitalize on the information exchanged. On each of your groups, you have the possibility to create your own news channels and distribute information within your organization. Landfiles puts your priority news in high visibility, by sending push notifications to your users’ phones. Use Landfiles to synthesize the diseases and pests observed by members of your groups. To do this, your users simply report the observations in Landfiles; for example: “High mildew pressure”, with or without a photo. Your keywords are detected by Landfiles and returned in the form of maps, distributed to your group via your news channel. Let us collect data on your group and make your life easier. Landfiles plays the role of both information historian, on the farm and on the plot, and as a collector of structured data. Landfiles is the power of an intuitive tool that allows you to increase the quality of your advice to farmers. What to do to get started? Create your group in Landfiles, and invite users. Contact us to set up the data collection and mapping service. Landfiles wishes the agricultural world a merciful 2019! 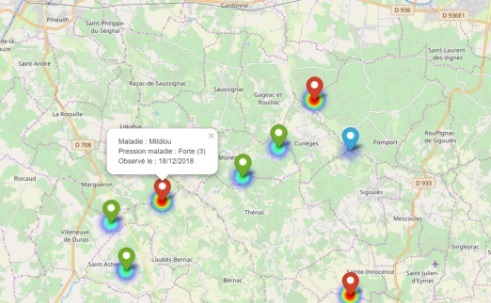 What does Landfiles do with the data collected from farmers?